With millions of people out of work and near record unemployment, these kinds of signs are commonplace in society today. As I was enjoying a cup of coffee and my breakfast this morning, I had the TV on. A commercial came on for one of our local food banks. It sought to remind viewers that the holiday season was just around the corner, and there would be a greater demand for donations this year. I have always done what I can to help, so I began to think of what I would put together to help the less fortunate in our area this year. Just then, I looked down and I noticed that Patchs (my wonderful Pointer / Healer mix) was saying exactly the same thing: “Will Work for Food”. She was sitting up on her haunches and she had her front paws in the air! She’s so cute … so I got up from my chair and I got her a milk bone. I don’t think that was what she was hoping for, but she still took it! The point is, that she was happy to do something for me in order to get something from me in return. That’s the basic premise of having a job! You do the work, and you get a paycheck! No, she doesn’t always get a treat. Sometimes it’s a simple pat on the head, or a tummy rub, or a scratch behind the ears. Other times it might be a walk, or a play session with one of the neighborhood dogs! But it’s a reward. A paycheck! 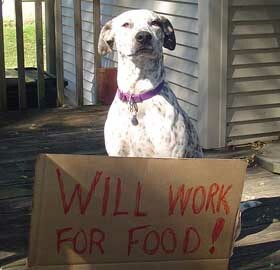 Almost all dogs will work for food! But to them it’s more about the job and the reward. Dogs want, and need, our acceptance. They also need a job as a way to burn off energy and to receive proper stimulation too. This, in itself, can be the reward. One well-known dog trainer calls it “your dog’s currency.” It’s important to remember this currency sometimes changes based on the job. My dog will do all of her basic commands for simple praise. An excited “good dog” or a brisk rub on her shoulders is all she needs. But when it comes to her tricks, she needs more than that. If you give her a tasty piece of Beggin’ Strip or a bit of a T-Bonz, she’ll run through every trick in her repertoire and never miss a beat! Different dogs like different kinds of jobs. Like humans, not all dogs like to do the same kinds of things. I once had a Dalmatian who loved to run, romp and wrestle with other dogs, and that was all he needed as a reward for being a good dog. He could care less if you threw a ball or Frisbee for him. On the other hand, my current dog will chase after anything that moves. From balls, to toys, to other dogs and even the neighborhood critters, if it moves she’ll chase it. But her preferred job is to keep squirrels off of the grass. It doesn’t matter how long the hours are, it is her passion! One of my best friends has a dog that only lives to retrieve pheasants, ducks and geese. Take the time to bond with your dog and help it find the right job. You’ll be happy you did … and you’ll be sorry if you don’t!